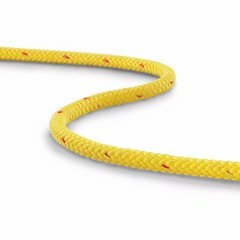 This water rescue rope is a spliceable floating rope for use in swift-water rescue applications. The rope has a durable nylon cover that protects the braided multifilament polypropylene (MFP) core from damaging UV rays. This combination results in a strong product that floats just under the water surface. The yellow signal color (with contrasting red or blue flecks) is easily spotted in water.